I am only assuming that other homes have regular flat walls- much unlike any home found here in the desert. 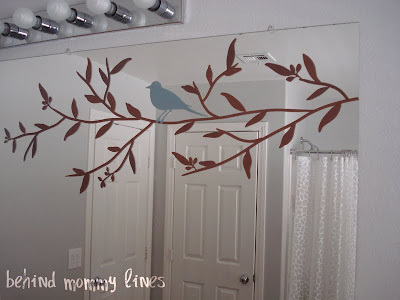 Otherwise, how do you explain the popularity of vinyl wall art? I have fought the good fight, trying in vain to keep my vinyl from falling off our exuberantly textured wall surfaces. When they say "best results when used on a flat surface..." they mean it! 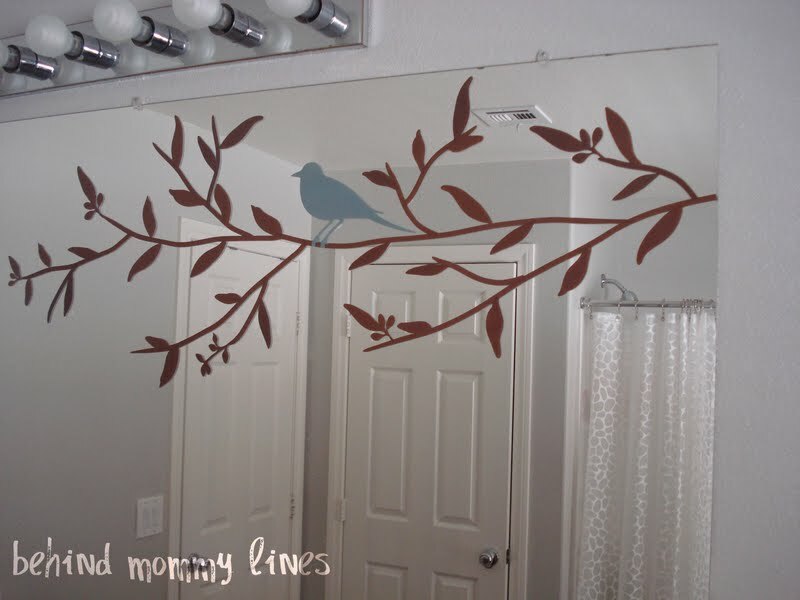 A while ago I fell in love with a little set of decorative vinyl... in the clearance racks of Home Goods. Three dollars? Sold! Except that I knew our walls were anything but hospitable for the cuteness. I saved them for "someday" in hopes of finding just the right spot for them. Well someday came and went. And by gosh I am just tired of finding a place to store stuff I may or may not use in the foreseeable future. 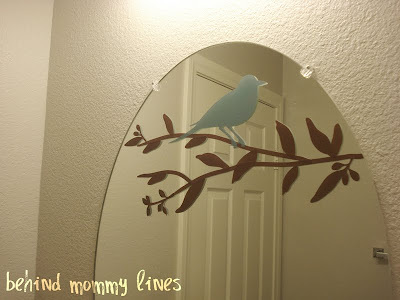 The most brilliant of brilliant ideas conked me on the head- I HAVE MIRRORS! Tons of MIRRORS! An unsettling amount of MIRRORS! And since I had a couple extras... the powder room got a little more pizzaz too. Hurray for actually flat surfaces! 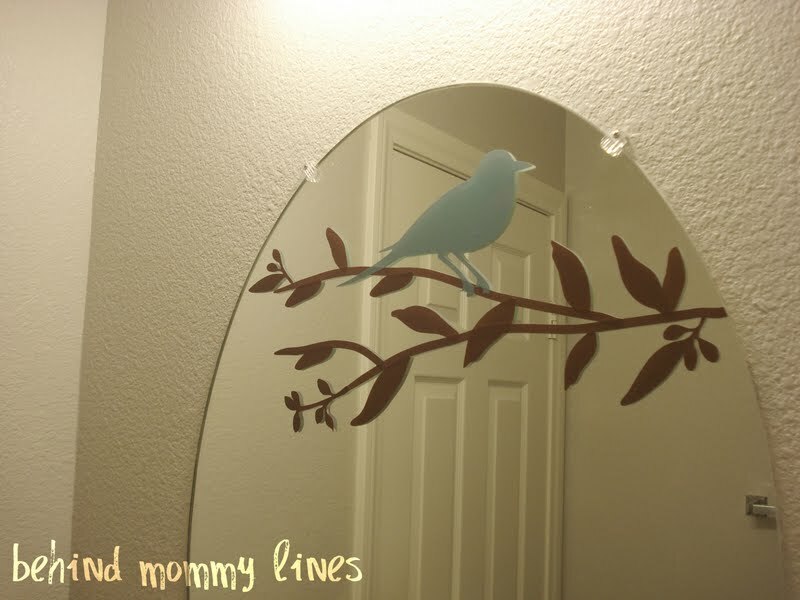 The girls love the birdies in the mirror. They talk to the birds often- and show off all the soap bubbles on their hands. I have affectionately dubbed them Merle and Moe. The girls are not a fan of the names and chastise me "No, Mama. Don't do that any more."